This morning, as Ellie woke me up at about 30 minutes before my alarm went off, I had the good idea to take her for a walk around the block while Mom was at swim practice. I got some coffee at Starbucks and then headed over to the pool to watch Mom. She wasn't exactly in a talking mood, seeing as she was in the middle of a practice, but the swim coach was a bit more open. He is finishing up college, which immediately made me feel like an old man. 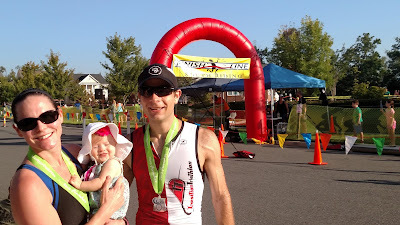 More flatteringly, though, it made me feel like a grizzled vet as I gave him all sorts of triathlon tips and tried to get him to sign up for his first. Though, I don't think that my pitch to the, ahem, swim coach, of "the swimming part is the least important" really resonated. I guess I could have phrased that better. Ellie has been going through a bit of a rough patch in terms of sleeping recently. She goes to sleep easy enough at around 6:30 or 7 (though she still hates the process in general - and lets us know about it), but she only sleeps for a few hours until she awakes, ready for the new day. The only problem is that it's actually the same day, and, I'm sorry dear, but that wasn't "going to bed" that was a nap. She doesn't agree with our assessment and will let us know about it. This past week, upon her first wakeup of the night, it's taken on average about an hour to get her back down. That includes last night where it only took me 45 minutes to get her back down, as well as earlier in the week when it took two hours. Nothing like hopping in bed at 10pm with an alarm set for 5:50am, only to have your daughter wake up 30 minutes later and not go back down until 11:30. At least I got 6.5 hours of sleep. I've still be feeling out my workout schedule with Ellie in the picture. With the exception of Saturday morning swims, I've been pretty flexible. My wife has been even more flexible, of course. Normally on Thursdays I go into the "downtown" office. I leave my house around 6 so I can beat as much traffic as I can, and then I go for a run at the office. Either on the treadmill in the gym there, or out on the trail, weather permitting. My wife leaves for work the same time that I do, so my mother-in-law is at our house by 6 on those days. As I got out of the pool this morning for my weekly LetSwim master's program, I thought about two exercise related things. The first was about how this would be the first week in quite some time I wouldn't swim on Saturday for the Tsunami master's program (the gym at which I swim is doing month-long maintenance to the indoor pool and how I would make up that absence. The second thing I thought about was how consistently I've been working out. I checked out my Strava training log and noticed that in the past 18 days, I've exercised on 17 of them. One big reason for that is Ellie is now big enough to go in the jogging stroller.